Sancerre is a village located at the eastern part of the Loire Valley in the upper central part of France. It is neighboring another famous village called Pouilly, making similar yet slightly fatter and rounder style Sauvignon Blanc wines. Sancerre is also not so far from where the Loire River curve straight down toward the western part of Burgundy and meet the Allier river finding its source in the mountainous massif central, in Auvergne. The Allier River, by the way, which also gave its name to, the famous Allier forest, which provides the oak to produce some of the best quality barrels in France. Sancerre produces some of the greatest Sauvignon Blanc based wines in the world, with characteristic flinty aromas and flavors due to the quite unique stony, slatey soil of the area. Some red(s) and rosé(s) are also crafted in smaller quantities. The Appellation was quickly confirmed in 1936 due to the long established reputation of its white wines and its unique Terroir characteristics. The AOC Sancerre Rouge was only established in 1959, permitting the production of red wine in Sancerre based solely on Pinot Noir grape. Since then, a small quantity of Rosé as always been produced. As said above, Sancerre has always been reputed for its whites, yet there are beautiful rosés and a small amount of red wines made from Pinot Noir here as well. 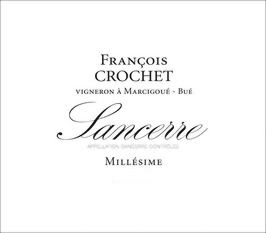 A few days ago, we bought a few cases of a great Sancerre Rouge from a very good producers called François Crochet. It is quite difficult to determine how many Crochet(s) there are in Sancerre. Lucien and Gilles Crochet are amongst the leading producers of the Appellation and benefit of old roots in wine farming, growing and making since 1765. Lucien and Gilles began to estate-bottle their wines in 1934, which was not a common thing to do for small family run wineries at the time. Most estates, in France in general, really started to bottle at the property by the mid-50s and beginning of the 60s helped by the passage of bottling-machine-mounted truck, going from cooperatives to small estates, etc… The presence and ownership of a bottling machine at the property itself didn’t really even occurred until the mid-70s, for the richest and most established wineries. And even nowadays, not every property possesses one and small property still continues to bottle their wines with a bottling-machine-mounted truck. However, let’s go back to François Crochet. It seems that before the name of François was associated with Robert Crochet, his Father who now runs with his wife Solange, the Domaine Crochet, not to be mistaken with Lucien Crochet. I'm a bit lost with all of the Crochet(s) and my research on the internet didn't lead anywhere regarding if Robert and Lucien were from the same family or not (may if they read this post they will explain it to me). You see the Crochet family has a long tradition of growers and producers attached to the history of Bué, a little village located southwest of Sancerre. François Crochet is a young talented winemaker who trained in Bordeaux and New Zealand and brought back his enhanced skills, knowledge and experience back to his native land to run his own winery (or the old family winery, but I can not confirm it) with his wife Carine (may be I should give him a phone call one of these days). François Crochet now produces some of the most refined, elaborated and exiting wines of Sancerre with a modern twist. And victim of his own success, he even has difficulty to keep up with the demand. The estate consists of some 10 hectares, mostly planted on the south facing limestone slopes surrounding the village of Bué. He only makes limited, handcrafted quantities, and most of his wines are available only on allocation. We were lucky to get a few cases of his Sancerre rouge. To craft his gems, Francois Crochet pays a great deal of attention to the quality of the grapes and keeps the yield low. Grapes are handpicked and submitted to rigorous triage (or sorting in English), resulting in expressive and aromatic wines with the distinctively flinty characters, especially for the white that only the unique terroir of Sancerre delivers. Made from 100% Pinot Noir partly aged in barrels (70%) and in stainless steel tanks (30%) for 12 months, the 2006 François Crochet Rouge is a concentrated Sancerre with great depth and well-balanced ripe cherry flavors with underlining minerality. Bottled with no fining or filtering and no prior excessive racking during the ageing period, time on lees gives the wine a lovely textural mouthfeel while a straight line of crunchy acid gives structure and focus. The palate is rich, velvety and textured with ripe, almost surprisingly opulent (for a Pinot Noir from Sancerre), earthy cherry flavors enhanced by a great acidity and beautifully framed by integrated tannins. The finish is quite vibrant, earthy and lingering. This is classic Sancerre with a modern, fuller twist, yet it reveals exceptional freshness and crunchy, aromatic ripe fruit and soft texture. An ideal partner to duck, poultry, grilled meat and cheeses. Step into the Green! Drink more Biodynamic and Organic wine (and food) from sustainable culture and respect the environment! Support the right causes for the Planet and all the people suffering all around the globe!